Dermaplaning is a method of manual exfoliation that consists of scraping off the top layer of dead skin cells in order to reveal a smoother, brighter complexion. Once the exfoliation is complete the patient will enjoy the benefits of having no vellus “peach fuzz” hair on the face as well as better skincare product penetration and performance. Dermaplaning can be performed on all skin types. It can also be combined with other treatments such as facials and chemical peels. 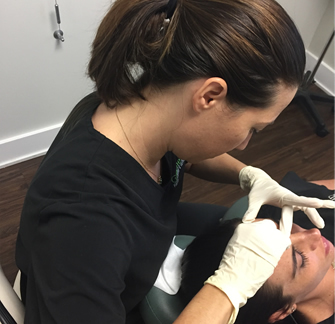 Because dermaplaning is a quick procedure with few to no adverse effects, it has quickly gained popularity among cosmetic medical providers across the country. Using a scalpel and a delicate touch, our esthetician Rebecca simply abrades the surface of the skin using light feathering strokes. This is a great treatment to offer to patients who are pregnant or nursing who want a deep exfoliation, but are not allowed to use peeling agents on their skin because of the risk that the chemicals will be absorbed into the blood stream, and may be transferred to the fetus or the child. It is also a first choice for patients who have excess vellus hair on the skin. This hair often causes a buildup of dirt and oils in the follicles, so removing the hair gives the patient healthier looking skin. Dermaplaning is recommended for all skin types except those with active acne. Patients wanting to treat acne scars, sun damage, fine lines and very dry skin are great candidates for dermaplaning. Patients that use Retin-A or Retinol creams must discontinue those products for 1 week prior to dermaplaning as well as 1 week after treatment. As a single treatment dermaplaning can be done in about 45 minutes; however, it can also be an add-on to any facial or chemical peel. Will dermaplaing make my facial hair come back thicker? NO, dermaplaning will not change the histology of the hair. This means that the hair will not come back thicker, darker or coarser than it was before having the treatment. How many dermaplaning treatments are needed to see results? Patients will notice their skin is immediately smooth after the treatment is completed but typically need treatments once a month in order to achieve desired results.